Last month Born Free Founder Virginia Mckenna OBE announced that Shamwari Group is now a sponsor for the pride of Cape Town arts event in 2013. This arts initiative aims to raise awareness and funds for the Born Free Foundation, and this year will be doing it by placing decorated lion sculptures – 50 in total, around the V & A waterfront in Cape Town. I have been fortunate enough (as a lover of conservation and art) to have seen one of Born Free’s previous initiatives of this sort in Norwich, a city near to my home town in Norfolk, England. 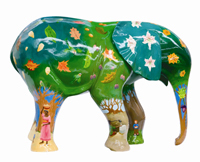 In 2008 there were 53 decorated elephants placed around the city as part of the ‘Go Elephants’ campaign. One of these art works was contributed by the college I attended, although sadly I wasn’t able to help with the decorating of the 120cm high fibre glass elephant myself as I did not study art or any subjects that allowed me to get my hands on the art departments’ projects. Following the city-wide exhibition, 41 of the elephants were then auctioned off, with proceeds going to both Born Free Foundation and cancer charity CLIC Sargent. The cheapest elephant sold for £1,700 and the most expensive one, decorated by award-winning artist Susan Gunn (and wife of former Norwich City Football Club goal keeper Bryan Gunn), for £25,000. Around £200,000 was raised in total. The art work certainly brightened up the city, and I’m sure it will do the same in Cape Town. According to Born Free’s Facebook page, the stars were also happy to put their names behind a documentary filmed at the Shamwari Game Reserve to accompany a new acoustic version of the song ‘Born Free’. If you have seen any of these Born Free sculptures around, I would love to hear about it! Hi Charlie, how brilliant to hear from you. 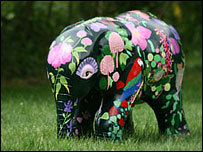 I loved the elephant’s around Norwich, and am having a good look through your site now. Great work and great charity to support!